Super Smash Bros. for 3DS brings the series to handhelds for the first time and it does so very well, with only a few glaring issues keeping it from true greatness. Our review. Once in a console generation, Nintendo's greatest mascots will come together to beat each other up in the spirit of competition. This instance of the Super Smash Bros. franchise is a little different, though. For the first time, the series has come to one of Nintendo's handhelds. Though the controls take ample getting used to, the transition is nearly seamless and Super Smash Bros. on 3DS proves to be an almost-perfect pick-up-and-play brawler for when you're on-the-go. For those unfamiliar with the wholesome violence of Super Smash Bros., the idea is to compete in brawls (either timed or with limited stocks) against up to three other players atop stages inspired by Nintendo classics. And the roster is filled with the who's who of Nintendo's greatest franchises, along with a few cameos. With 2001's Super Smash Bros. Melee considered by many to be the peak of the franchise, it's no wonder that so many players are attached to the Gamecube controller. For those players, the 3DS version's controls are going to be a shock to the system. Fortunately, the Smash Bros. series' controls are friendly enough that the learning curve proves to be fairly simple. The transition to the Circle Pad proves to be mostly seamless, aside from the fact that it proves much easier to jump with X or Y than it is by holding 'Up' on the pad in this version. Simplicity is to the game's great benefit, since much of the appeal of Smash Bros. is how easy it is for anyone to pick up and play. There should be no fear of anyone getting left behind. Those looking for more speed in their Smash Bros. games will be relieved to hear that fighting in the 3DS version feels a lot faster than Brawl. Fighting feels far more precise and fluid, compared to this game's predecessor, while doing away with some of the more hated ideas, like random tripping. There are also some helpful new features that add to the action, rather than get in the way of it. 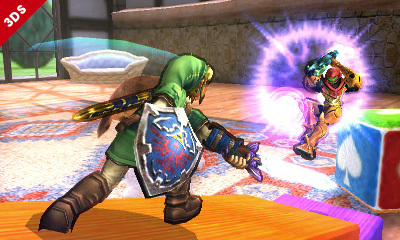 For example, some new visual effects are tossed in to help indicate when smash attacks connect, meaning you'll be able to better tell when you've connected with a hard hit. There are also some color cues to help indicate when your characters have undergone stage-induced or damage-induced boosts. 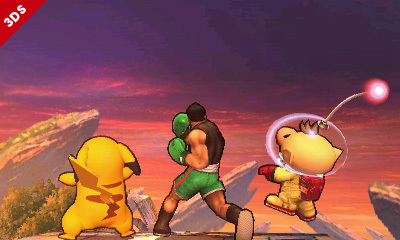 Customization is a major new aspect of the Smash Bros. experience. Inspired by a similar mechanic in Brawl, players can collect clothing equipment to help boost one stat at the expense of another. It adds a degree of complexity to the proceedings, but also makes your character feel more like your character, in the sense that you can tune him or her to your specifications. Although the more I tried this element out, the more I felt perfectly happy with the character stats as they were. King Dedede, for example, is who he is for a reason. While it's tempting to try and turn him into a defensive tank, I felt it somewhat compromised him as a well-rounded fighter. If the optional equipment aspect isn't appealing, there are also unlockable attacks for each character. Standard attacks can now be replaced by similar ones that are tweaked slightly. For example, Luigi's rising punch is a useful attack, but it can be exchanged for a punch that hits more on the way down or one that has better range that doesn't hit quite as hard. Discovering these attacks over the course of the game adds some ample replay value and adds a personal touch to fights with friends. Of course, those that feel it to be a tad too complex also have the option to turn the feature off. Story and narrative have never been a strong part of Smash Bros, which makes sense. It's about getting in the arena and duking it out. But love or hate Super Smash Bros. Brawl's 'Subspace Emissary' adventure mode, there's no denying that it provided hours upon hours of single-player content. Without that story, the single-player offerings are a bit thinner. 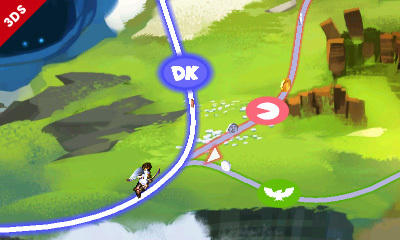 The Classic mode takes a step forward with a makeshift overworld with branching paths. Though the structure is basically the same, with giant, metal, and team battles sprinkled in, it's nice to be able to choose your opponents and grab some coins along the way. Classic also stands as one of the primary ways to earn collectible trophies through a slot machine mechanic. All-Star mode also makes its return, pitting players against batches of opponents based on the era they debuted, giving it a novel historical atmosphere. The other single-player modes are fairly standard, including staples like the Multi-Man Brawl and the Home Run Contest. The traditional 'break the targets' mode has been replaced with an Angry Birds-like mode called Target Blast. They're nice diversions, but nothing too engaging. The most intriguing new addition is Smash Run, which proves to be one of the most interesting additions to a Smash Bros. game in a long time. Either playing alone or locally with other 3DS users, the idea is to run through open stages filled with minor enemies from across various Nintendo franchises for five minutes. Players collect bonuses from fallen foes that boost certain stats, like attack, jump power, and speed. It seems shallow on paper, since it was all apparently building up to a boosted-up free-for-all brawl, but I was pleased to see this isn't always the case. The final confrontation following those five minutes actually varies from different types of brawls, to races to the finish line, to survival against waves of enemies. There's far more variety to Smash Run than meets the eye and it turns out to be a pleasant surprise. If Super Smash Bros. Brawl had a true failing, it was its near-unplayable, lag-filled online play. With years to seemingly address this issue, a more playable online Smash experience seemed to be in order. Unfortunately, though Nintendo has taken some steps forward, some of its new features introduce a slew of new problems. My first online battles were not pleasant. I was quickly getting flashbacks to Brawl, as the match was slowed to a snail's pace because of lag and buffering tended to stop the whole thing entirely. It took about three minutes for 15 seconds of the match to unfold. I had to accept that this match simply wasn't going to work, so I quit. Then I discovered that I had been banned for 24 hours, since I had left a match. The game never took the insane latency into account and penalized me for jumping out. This unintentional penalty spells out a major problem for this game's online modes, since it essentially punishes the player for Nintendo's online failures. It's a problem that could become a frequent one, since the game's 'With Anyone' online mode doesn't offer a regional setting to connect to anyone close by. Super Smash Bros.' online play has steadily improved over the past week, showing that Nintendo has every intention to address the game's shortcomings in that area. Unfortunately, whenever lag does creep in, it's nearly game-breaking and serves to kill the whole experience. Since a big part of the Smash Bros. appeal is its fast pace, the lag issues continue to make online play one of this game's biggest weak points. It's as close as Nintendo can possibly get towards packing in the addictive pleasure of the console versions onto its 3DS handheld. Fans couldn't ask for a better appetizer to the Wii U version set to hit later this year. This review is based on a Nintendo 3DS download code provided by the publisher. Super Smash Bros. for 3DS is available in retail stores and on the Nintendo eShop on Friday, October 3 for $39.99. The game is rated E10+. 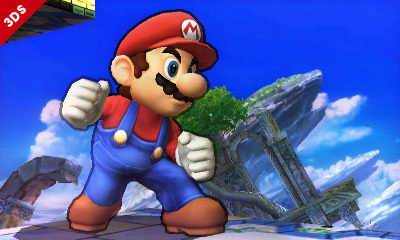 Ozzie Mejia posted a new article, Super Smash Bros. for 3DS review: a smashing transition. Are Japanese gamers experiencing this lag, or just reviewers here in the U.S.? Both, from my end. But like I said, it's gotten better. Patches have been deployed, so expect a day one patch on release day here. I just can't bring myself to get this on the 3DS, unless something changes and I have to in order to unlock characters or some other BS. The Demo showed just how big of an issue that small screen is and the pad was not made for the quick and precise action required. I can see your side, and while I cannot disagree that, even though I have an XL, the screen is a bit small for what i'm used to in a smash game and the 3DS doesn't have that great of a control scheme for a game like this, I still had a lot of fun with the demo and grown used to those things. I have been hyped for this game for a very long time, so there is no way i'm going to let those two setbacks stop me from getting this game, which is only $40. The 3DS version does have a couple of mode differences, as well as different stages, anyway, it's not like they're the exact same game. The Wii U version will have it's own unique modes and stages, so I have no problem getting both versions, personally. Yeah, I might grab it once the New 3DS shows up if the pad can handle it.